Brilliant Women charts the sparkling trajectory of the original “Bluestocking Circle”. This group of celebrated women broke through gender boundaries to make a unique contribution to learning and art in 18th century Britain. They refused to accept that women must be excluded from “the life of the mind” and established their right to be writers, artists, historians and thinkers. The term “bluestocking” applied at first not only to women, but also to the men who were part of their movement. Facilitated by three wealthy and accomplished hostesses – Elizabeth Montagu, Elizabeth Vasey and Frances Boscawen – they set out to reform society with the enlightenment ideals of culture, conversation and friendship. It is said they were dubbed “bluestockings” because some were so keen not to be late to meetings they turned up in their everyday clothes, without – horror of horrors – changing into white silk stockings. They had a shared contempt for the low-life habits that dominated the English aristocracy – drink-sodden and obsessed with gambling, horses and the market in land and marriage. The National Portrait Gallery’s exhibition, which was seven years in the making, introduces us to the leading lights through portraits, manuscripts and artifacts. The curators were particularly pleased that a private owner agreed to lend a wonderful portrait of Elizabeth Montagu, by the Scottish artist Alan Ramsay. Her handsome face gazes into the middle distance. Seated on a velvet chair, she wears a rich red silk gown, with jewels that mark her as women of wealth as well as intelligence. Montagu threw open the doors of her London home to men and women who wanted to practice the “union between the scholarly and the sociable, the masculine and the feminine” which the Scottish Enlightenment philosopher David Hume had said was essential for the creation of a “reformed republic of letters”. Montagu considered herself “a Critick, a Coal Owner, a Land Steward, a sociable creature”. She ran her husband’s estates and coal mines and was a great patron of art and literature. She also penned a monograph comparing Shakespeare with earlier poets and challenging some views expressed by Voltaire on the subject. Writer Samuel Johnson called her the “Queen of the Blues”. Other members of the circle included the dramatist Hannah More, who later became a leading member of the anti-slavery movement; Fanny Burney, novelist and spiritual godmother of Jane Austen; Elizabeth Carter, who made her living as a classical scholar and journalist and Hester Chapone, whose book Letters on the Improvement of the Mind ran to 16 editions. The display goes on to demonstrate how the impact of the bluestocking circle spread to bring about a significant change in the way in which women in England were educated, accepted, published and even paid as academics, artists and thinkers. Indeed, the notion of an educated and virtuous Englishwoman was adopted and promoted by the Establishment to mark the difference between advanced Britain and decadent France. A wonderful painting by Richard Samuel, The Nine Living Muses of Great Britain, shows nine women pictured, perhaps for the first time, not for their beauty or birth, but for their achievements. Their faces are entirely stylised: Elizabeth Carter remarked wryly “by the mere testimony of my eyes, I cannot very exactly tell which is you and which is I and which is anybody else,” – and clearly its purpose is not to record a historical moment but to present an ideal. 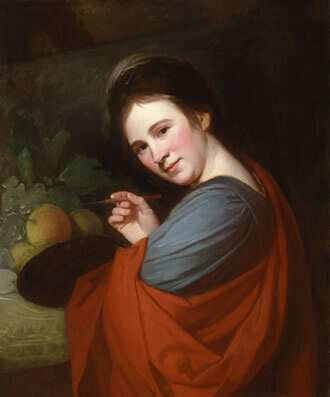 A portrait by George Romney of the artist Mary Moser (the first woman member of the Royal Academy - the second one was not until 1936!) shows her at working at the easel. At this time painters would be more likely portrayed as men about town than celebrating their artisanship – clearly a political point is being made. One of the Nine Living Muses was the historian Catharine Macaulay, whose eight-volume History of England was seen as the radical alternative to David Hume’s very conservative History of Britain. Macaulay’s portrait dominates the final room, which charts the downfall of the bluestocking movement, and the bitter reaction to the French Revolution, that drove women back into the drawing room. Fifty years later Mary Anne Evans and the Brontë sisters were still forced to hide behind men’s names. Macaulay’s portrait hangs next to that of Mary Wollstonecraft, and these two radical figures felt the full force of reaction. Both were vilified for their unconventional private lives and their feminism, but it was in reality their republicanism and support for the French Revolution that brought the full hatred of the establishment down on their heads. 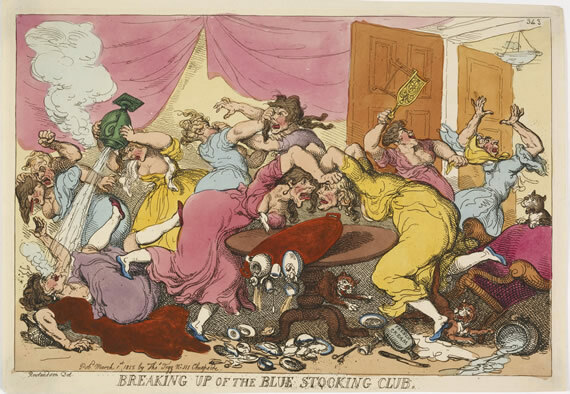 The reaction against women thinkers is illustrated by a vicious caricature showing the bluestocking women involved in a vulgar scrap. For someone whose history encompasses that moment in the 1960s when demands for equality for women re-emerged as a political force, it is revealing to see the same stereotypes faced then, being used against women 200 years earlier. 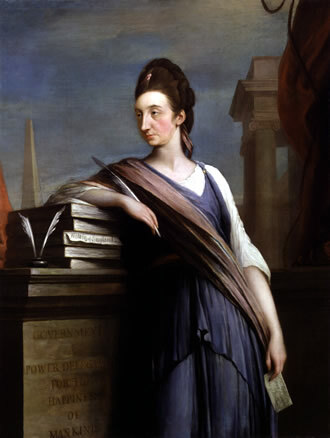 This thoughtful and well-researched exhibition was created by two present day bluestockings – Elizabeth Eger who teaches English Literature at King’s College London and Lucy Peltz, 18th Century Curator at the National Portrait Gallery. And if you can afford it, or are in line for a birthday present, the accompanying book is beautifully written and produced. Brilliant women - 18th Century Bluestockings is in the Porter Gallery at the National Portrait Gallery, Saint Martin’s Lane until 15 June. Admission is free. On two sides of the corridor outside the show are a set of very elegant portraits of some present-day bluestockings – from Judi Dench to Annie Lennox; Zaha Hadid to Vivienne Westwood. Musician turned photographer Bryan Adams celebrates famous women of all ages and professions, but invites each of them to dress in their most fabulous dress for the sitting. It makes them all seem rather uniform – the uniform of fashion – but gives a surface equality that allows Adams to show many different kinds of beauty and intelligence.